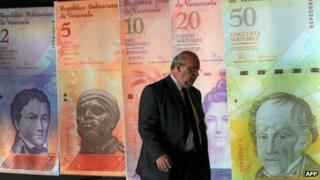 Venezuela has announced measures to address its foreign currency crisis and boost the economy. Oil Minister Rafael Ramirez says Venezuelans travelling abroad will no longer be allowed to obtain foreign exchange at the official rate of 6.3 bolivars per US dollar. They will have to pay a higher rate, determined by weekly currency auctions. The official rate will be used only for essential goods, such as medicine, industrial supplies and food. "The big discussion here is whether we give dollars to travellers or we import food," said Mr Ramirez. The weekly dollar auctions will be increased to $220m (£132m) a week to benefit private companies that have been struggling to import raw materials and other supplies. Mr Ramirez, who is also the president of state-owned oil company PDVSA, promised to unveil further details of the new multi-tier currency system. Despite its oil wealth, Venezuela has faced a shortage of staple goods, such as sugar, cooking oil and toilet paper. Many businessmen say the shortages are due to the mismanagement of the economy, including the tough currency controls introduced in 2003 by the late president, Hugo Chavez. But his successor President Nicolas Maduro has repeatedly accused "unscrupulous businessmen" of manufacturing the crisis to undermine his left-wing policies. In his state of the nation address before the National Assembly last week he vowed to introduce tougher penalties for "sabotage and speculation". While changing money on the black market is a crime, it is very easy to find a trader, says the BBC's Irene Caselli in Caracas. On the black market, dollars can be bought and sold at 10 times the official 6.3 exchange rate. In November, Mr Maduro was granted special powers to govern by decree for a year to deal with the economic crisis. He has since announced a number of measures, including official controls on the price of new and second-hand cars. Last week he said his plan to boost the economy had been "very successful." What's behind Venezuela's economic woes?